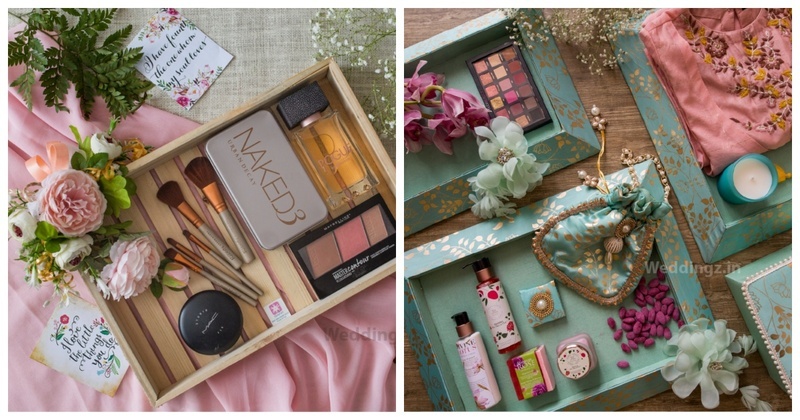 7 Luxury trousseau gifting ideas for your wedding gifts & favors! While you will give a lot of thought to what kind of decor your mandap will have and the flowers that will go in your mehendi backdrops, you may skip out on planning the tiniest details in your wedding which matter too. These small things reach out to your guests or the couple themselves in hand and help in creating some really cute and adorable memories! Whether you are looking at how to pack your wedding favors for your guests or how to decorate that wedding invitation tray to create that awesome first impression or looking at a beautiful way to present your wedding gift to the newly weds, you’ve got to do it in style! I recently came across a few products from Floral Art by Srishti and believe me, they are a lifesaver! Swap your regular baskets for these beautiful welcome hampers like these ones. These wooden trays with artificial foliage of pink and white flowers giving it a soft touch, beautiful isn't it? Forget about the traditional white satin ring bearer pillow and the artificial red-rose that’s often used as a ring bearing box. Go for this beautiful box that’s got these delicate lilac and peach artificial flowers on the top, giving it a very elegant touch! Now these set of luxury trousseau gifting packaging boxes can be either used by the couple to give away their wedding favors to their guests, or they can be used to gift the newly weds some really cool stuff. Just fill these in with your favourite goodies and send them over. I for one, am in love with this lavender goodie box set with the lace detailing and the peach and lavender floral touch to it. These luxury trousseau gifting boxes of delights will be the perfect gift for the newlyweds. You can pick amongst the various personalised ones to the ones in different colours and shapes. Get the couple’s favourite colour, fill with some ah-mazing goodies and your gift will definitely will be a hit. Okay, can we just take a moment to go through this super cute and unique Mr. and Mrs. gifing box with the gorgeous artificial foliage? It’s a perfect keepsake memory for the newly weds, plus it’s so damn cool. It also doubles up as a box to the invite. You can fill these in with gold coins, cash or anything that fills in your fancy. Fill ‘em up with some special treats like - exotic chocolates, dry fruits, and munchies for your guests to feel extra special at your wedding. P.S it also doubles up as a pooja thali to welcome the groom when he’s arrived at your doorstep with this entire baraat. Give away your wedding favours in this welcome hampers with a rustic vibes. You can fill it in with what your heart desires from the chatpata namkeen to just-baked snacks to macaroons or just put one of each category. Loving these pastel floral boxes with drawers. These are perfect to send across your wedding invitation with some delicious mithai & sweets! Why not gift those precious jewellery sets in an equally stunning jewellery box? I say, it’s a no-brainer! Sadly with this, our list of these beautifulll products come to an end. Hoping that this will make you plan a little for these small but important wedding details in prior as well. To tell you a little about the creator of these, Srishti herself, she is based out of Mumbai, but she delivers all around the globe! She is also pretty great at preparing customised jaimalas, floral jewellery and phoolon ki chaadar, you can check out her work here.